The Easter 1908 photograph is one of the iconic images of the Milton Historical Society, reproduced on postcards and sold in their gift shop. Original image; see the restored image and related article in the April 27, 1908 Milton News letter. The hats stand out immediately, for this was the age when a big splashy Easter bonnet was de rigueur for the middle and upper classes. 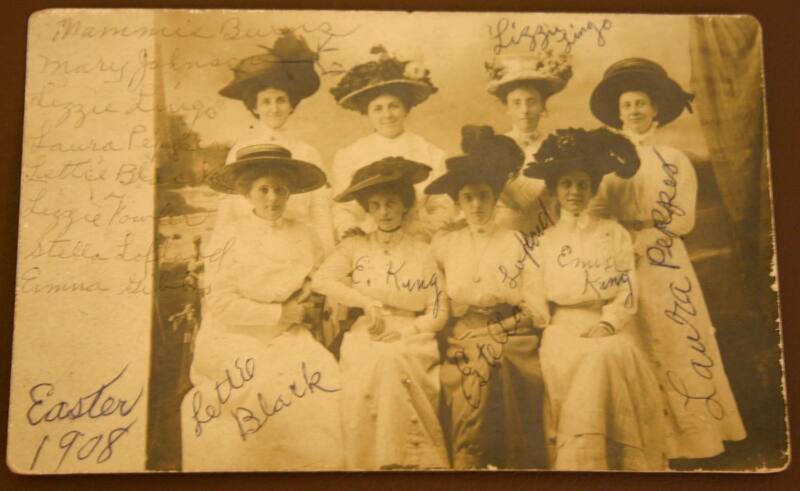 Fortunately for the historian (but not for the conservator of photographs) the names of the eight ladies in the photo were all hand written on the photo itself. As with the other notable group portrait in the MHS collection—the nine women of the Milton W. C. T. U., from Fredonia Wilson’s album—two questions arise: who took the photograph, and what brought these particular women together for their Easter 1908 portrait? The first question is probably the easiest to answer: the photo was probably made by an itinerant, since Milton had no resident studio photographer in those years, and travel to Dover or Smyrna to find the nearest studio would have been taxing. The second question—the group affinity—is more complex. With the exception of Emma King, who is a few years younger, all of the women were born in 1883 or 1884. Two of them – Emma King and Elizabeth King – were sisters; their first cousin Laura Pepper was also in the group. Lizzie Lingo and Lettie Black were first cousins. Estella Davidson Lofland was more distantly related to the Conner family, by marriage, through Susan Conner’s husband, William Henry Davidson. Only two of the women were known to be married in 1908: Lizzie Lingo (April 1908), and Mary Beideman (1902). The education levels of seven of the eight women are known; three graduated high school, two completed two years of high school, and two did not go beyond the eighth grade. [i] This would all but eliminate the possibility that the women were long-time classmates. What, then, is the affinity that brought these women together for this group portrait? There are certainly family relationships among some of them, as we have seen, and social aspects as well. Letitia Black, Elizabeth Black Lingo, Elizabeth King, Estella Davidson Lofland, and Laura Conner Pepper, as well as other sisters, went to the same parties[ii] and moved in the same social circles. They were apparently the “popular” girls of town, or the 1908 equivalent. Mary Johnson and Mary Burris were not part of this social group. Letitia “Lettie” Black (1884 – 1952) was the daughter of Milton postmaster John R. Black and older sister of Lydia Ann Black. The latter is known to all by her married name, which happens to be the name of the Lydia B. Cannon Museum; she was the benefactor who bought the deconsecrated Grace Church building and made a gift of it to the Milton Historical Society in 1971. Letitia’s grandfather Joseph Black was a co-owner of Black & Black, the shipyard that built the schooner Fannie Kimmey in 1879; the other owner was Thomas Black, her grand-uncle. She was quite active in several civic and church capacities, including the Epworth League and the W. C. T. U. She, her brother Thomas and sister Lydia Ann eventually all moved to Philadelphia. To the right of Lettie Black is Elizabeth “Lizzie” King (1883 – 1986), later to be Mrs. George Grice Fowler. Both her married and maiden names are used, but she was not married until 1910. Husband George was a bookkeeper and bank clerk; they moved out of Milton to Newark, N. J. when George secured a job with a Wall Street firm. Estella Lofland, the married name of Estella Davidson (1884 – 1972), is third from left. She was active in the Daughters of America (the women’s auxiliary of the Improved Order of Red Men). Emma R. King (1887 – 1955), later Emma King Gibbs, was Lizzie King’s younger sister. She was the last to be married, in 1924, to Julian E. Gibbs in Philadelphia. Laura Pepper was the married name of Laura M. Conner (1884 – 1963). She was the daughter of David A. Conner, the Milton correspondent of the Milford Chronicle, whose weekly Milton News letter endured for the better part of three decades. She was also first cousin to Lizzie and Emma King. She was not yet married at the time this photograph was made. Lizzie Lingo was the married name of Elizabeth M. Black (1885 – 1949), Letitia Black’s cousin. She was a newlywed when this photo was made. Mary Johnson was probably the married name of Mary Beideman (1883 – 1962); she married Oscar P. Johnson, a farmer, in 1902. Mary P. Burris (1884 – 1968) is probably Mary P. Johnson, wife of E. Frank Burris; this is a guess based on a land transaction with both her maiden and married names on it. Her dates are from a matching record in findagrave.com. No other data has been found at this point. [ii] Look at the October 10, 1902 and October 9, 1903 issues of the Milton News letter and you will find them on the guest list on two separate occasions.